One of the highlights of my last couple months here in Seoul is definitely my home. There are so many things I adore about it, from many runs to my favorite place in the world, Daiso, to rummaging in flea markets for salvaged wood, to being able to expand my pantry and become a more inspired cook. Two big highlights to mention are that I was the first tenant to move into my place, and when I arrived it smelled like fresh paint; and it’s a forty-five second walk to work. It would literally take me longer to cycle and then chain my bike. But the best part so far has been the experience I’ve had with my landlord, Mr. Jeong. I’ve never lived somewhere and felt so heard and cared for. I live in the same building with two of my co-workers, and we all feel comfortable and thankful. His attention is the antithesis of the landlords in your nightmares, or more accurately, of our realities, who scam people every which way. He does many little things for us like deliver our bills to our doors from the mailbox so we don’t miss them, install carbon monoxide detectors, and take us to Dongmyo on a Sunday to see the flea market. My coworkers and I wanted to give him a little thank you for everything that he has done, so we decided to take him to dinner right before the New Year. Little did I expect that it would turn out to be one of my favorite days ever in South Korea. We chose to have dinner on a Saturday evening right before the new year to wrap up a busy teaching week. To avoid the dinner rush, my coworkers met up with him around 5:30. 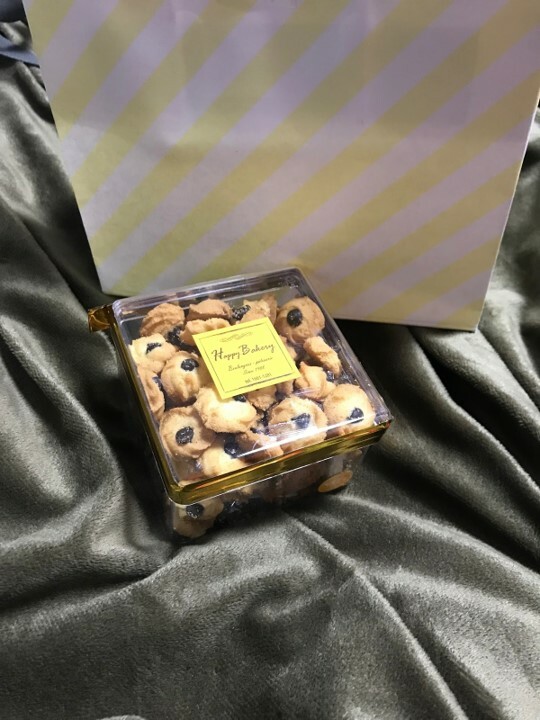 To my surprise, he brought his friend, who greeted us each with three different types of cookies from a local bakery. I was so surprised, especially considering I had never met her before. We made the walk to the restaurant, skirting the outside of Olympic Park, with its barren trees properly in winter mode. On the walk, I found out that his friend is a prominent artist! She shared that she does a lot of metalwork, especially with fine silver. Showing me photos from her exhibitions, I’ve never seen metal worked with so intricately; it looked like dental floss! 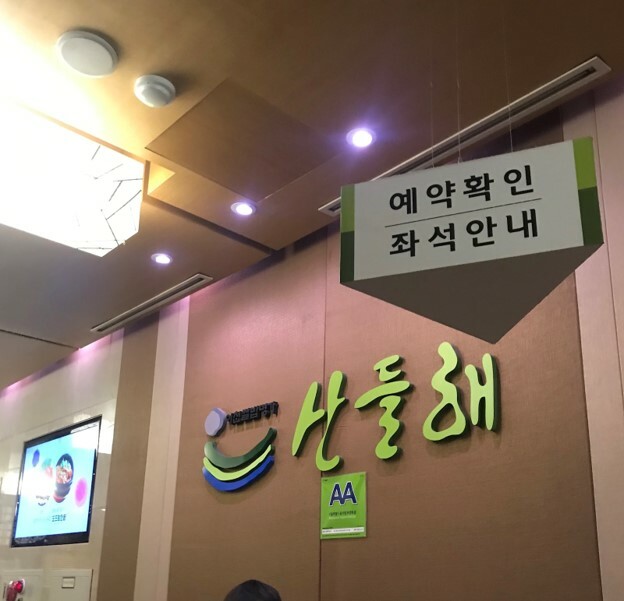 When we arrived at the restaurant, it was bustling, but the wait was pleasantly short. We waited about fifteen minutes to be seated, and chatted about our different lines of work. Before we knew it, our buzzer rang and we went to our table, which was a very beautiful wooden one near the back, overlooking the rest of the restaurant, which was filled with young families, old friends, and everyone in between. 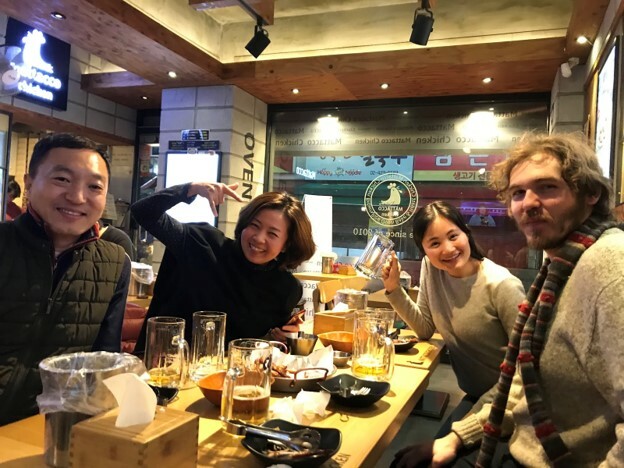 This restaurant is one of my favorites in Seoul, and I was happy to share the experience with my co-workers who had never been before. Our landlord took the reigns and ordered delicious plum wine to accompany our meal, which was the star of the show. For 16,000 KRW, you get a whole spread of dishes, which they slide onto your table at once. The best part is when you want more fixings, they will just slide you a whole new table’s worth of food! They serve everything from raw crab, to perfectly crispy kimchi, to grilled pork belly. They have plenty of vegetable banchan plates, which was great for not only my vegetarian co-worker, but for all of us. I actually enjoyed the veggie dishes the best, especially the lotus root that was marinated in a creamy sauce that I don’t even know how to describe! It’s dinners like these that make me so thankful to be alive and well and meeting such kind, warm people. Although we all had such varying fluency in Korean and English, we were able to share stories and I learned a lot about him and his friend. I learned that he is a very successful photographer who recently photographed the mayor of Songpa, and his friend also shared what it was like growing up in Jeju-do. We spent hours talking and eating and drinking and more eating. After dinner, we walked through Bangi Market, which was adorned with technicolor holiday lights. We all bought fresh strawberries and other produce from the local vendor, and we even made a pit stop to Daiso where they helped me find the right detergent to use for my machine! And if we hadn’t eaten enough, we went for chicken and beer at Mr. Jeong’s favorite local place, and talked even more. 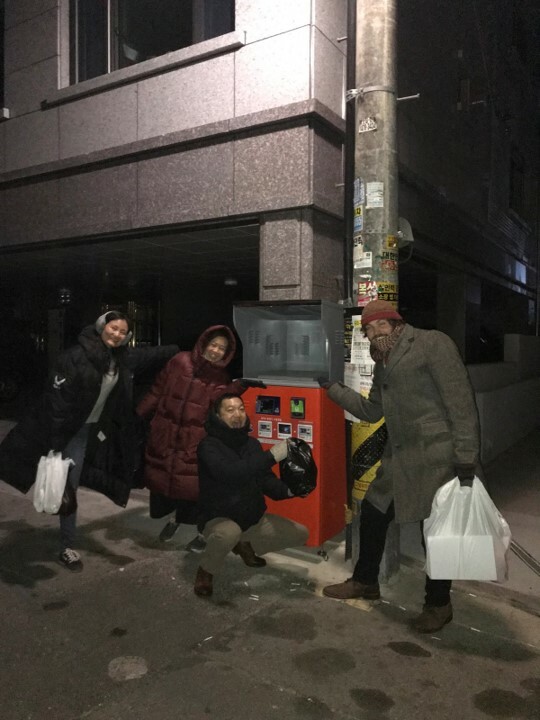 On our way home, he showed us tips on the best place to tailor clothes, and we even took a silly picture by the brand new food disposal bin he put in so much effort to install, which is much cooler than it sounds. You don’t even have to use a plastic bag to empty, only your loaded T-money card and you’re good to go--and for anyone who knows what a sometimes smelly nuisance food disposal can be, this machine is a godsend. I went to sleep that night so content and in awe of the kindness and energy that the people around me here invest in ensuring that life can not only be comfortable, but full of care and warmth. A few days later, Mr. Jeong knocked on my door to help with a translation problem I had, and surprised me with three custom glass picture frames for me and my coworkers that he made printing photos from our second dinner at the chicken place. I keep it on my mantle now and it’s a reminder of how lucky I am to live in a place like this with people as kind as the ones I’ve met.